It’s so important now, more than ever, to consider the carbon footprint that we as individuals leave behind. Saving power and energy not only helps save money, but it helps save the planet for our future generations. Waste King has taken this thought into effect by producing some highly efficient garbage disposal units. 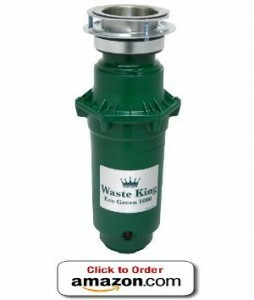 The Waste King 1000 Eco Green Food Waste Disposer is the most efficient you will be able to find. With a powerful motor, the 1000 Eco Green will grind through food waste in literally seconds reducing run time so that it will help save electricity and water. The permanent magnet motor is much more efficient than the induction motor counterparts, which means you are getting more bang for your buck. When it comes to garbage disposals, a unit that offers 1 horsepower is top-of-the-line. Not only does the Waste King 1000 have a 1 horsepower 2,800 RMP motor that will grind up tough food waste faster and quieter than the competition, but it also does it with less water making it an Eco-friendly choice for people who enjoy green living. The high horsepower and RMP allows this unit to pulverize and grind food into tinier particles than the competition which prevents pipe clogging and drainage problems. When the food waste particles are smaller they also decompose quicker which is better for the environment. The Waste King 1000 Eco Green garbage disposal is a continuous feed food waste disposer which means you can continuously add left overs, potato peels, plate scrapings and any other food waste you’ve accumulated while the unit is on. There is no need to prefill the chamber until it’s full, cap the top, then grind in batches such as a batch feed model, this garbage disposal will let you continuously grind until all the food waste has been disposed of. The outside is constructed of a heavy-duty plastic shell, and the grinding components are stainless steel which is rust and corrosion proof. All Waste King garbage disposals come with stainless steel grinding components so that you are ensured of durability and a long lifespan of the product. Many people complain of needing to replace their garbage disposal model every few years which can be a pain, but you won’t face that worry or hassle when you purchase from Waste King. While many standard or basic garbage disposals sound as loud as a freight train when in use, Waste King produces food waste disposers that are significantly quieter than the competition. Even though this 1 horsepower motor is extremely powerful, you will hardly know it’s on when the water is running which is a relief to people who hate the idea that they can’t hold a conversation with someone in the same room as a running garbage disposal. The installation for the Waste King 1000 Eco Green model simply could not be easier. It will fit and mount to ANY existing sink flange. There will be no need to hire a professional so you can save time and money. The unit is light and small compared to other 1 HP disposal units which means you can easily maneuver it even it tight spaces. The Waste King 1000 Eco Green weighs in at a comparatively light 15 pounds, and 16” H x 6.25” W. The extra slim design is not common for a typical 1 HP garbage disposal unit so if you want all the power without needing to take up all the space, this model is the perfect option. The Waste King 1000 Eco Green helps reduce the carbon footprint a person puts out. Normal consumption uses less electricity than a 60 watt light bulb, and the permanent magnet motor cuts grinding time in half which means less energy and water consumption. As with every Waste King product, there are a lot of excellent features and specs that will have any homeowner excited. Here are the features and specs for this particular model. The powerful motor is a permanent magnet motor which is rated better than the typical induction motor because it cuts grinding time in half. Not only does it pulverize and grind at a faster rate, it also creates smaller food particles which is not only better for your plumbing, but it’s better for the environment because it breaks down quicker. For those individuals who want to tackle installation themselves, there are easy to follow instructions along with plenty of online videos should you need more assistance with the installation process. Since the model will fit onto any current sink flange, you will not need to worry about all of the extra work of replacing the current flange you are using. The warranty on this product is amazing. As long as you live in the house where your garbage disposal was originally installed, you will have lifetime in-home service available to you should something happen to the unit. Waste King is committed to service and durable product design so you will also be assured you are getting the best of the best. Inside the box you will find the Waste King Legend 1000 Eco Green unit, the mounting hardware, and the power cord. The Waste King 1025 Sink Stopper & Splash Guard, the Waste King 3101 ISE Adapter Kit (which allows you to convert a 3-bolt mount into an EZ mount flange to accommodate the Waste King disposal), the Waste King FRC-4016 Fiber Optic Controller Base Unit & the Waste King FOS-4017-SN Fiber Optic Controller Switch so you can install a one-touch control switch to operate the disposal at your convenience in the location of your choice (no hard wiring necessary). The 1000 Eco Green unit not only works extremely effectively, it’s efficient when it comes to power and water usage. Since it grinds quicker than other disposals, it can save a large amount of electricity and water of its lifetime. 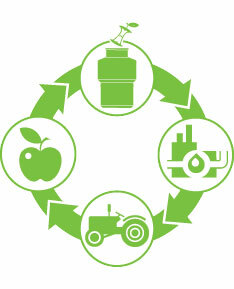 The 1000 Eco Green is also one of the smallest 1 horsepower garbage disposal units currently available. If space is a premium in your cabinetry, you will love the fact that this unit is slim enough to allow under counter storage even while the disposer is in place. One of the best things about owning a Waste King food waste disposer is access to their warranties. Waste King offers the best warranties available. With lifetime in-home service and lifetime corrosion protection, your investment will be protected and you can rest assured knowing this is one less thing you will have to worry about should it break down. There was hardly a bad thing to say about the Waste King 1000 Eco Green unit. A few customers noted that the rubber splash guard was quite stiff which can cause it to drain a bit slower than normal, but no one seemed to notice clogging or drain blockage, just a result of the splash guard. There are splash guards that have a ½ inch hole cut into the center that will alleviate this particular problem should you find yourself in the same boat. This unit has been rated above average for almost every customer who owns it. Over 80% of owners gave it almost perfect or perfect scores with only a few others that experienced some issues. Most comments included how great the product was along with how surprising quiet it operated. With the power, size, and energy efficiency it’s clear to see what it is a popular model. You will be hard pressed to find another 1 HP garbage disposal unit that is priced as nicely as the Waste King 1000 Eco Green is priced. As of this moment, when the review was written, Amazon has by far the best price currently available for this unit. Garbage Disposal Brands- Which is the Best? Garbage Disposals and Septic Systems- Will They Work Together?